In our last post, we saw how an ancient gunsmith would build the head piece and tail piece and assemble some of the parts of the manual rifling machine. In today's post, we will deal with another important part of the machine, the rifling cutter. Briefly, the rifling cutter is the part that actually cuts the grooves on the barrel. 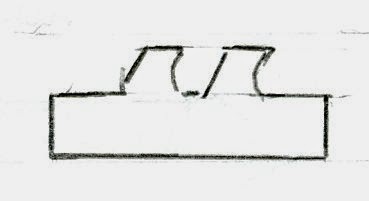 There were several designs of rifling cutters over the ages and we will study some of the common variants in today's post. First, we have the actual cutting tool. This was usually made of forged steel, with one or more sharp cutting edges. Once the sharp cutting edge was formed, the gunsmith would harden the cutting tool using the same heat treatment techniques that were known to sword smiths. A cutting tool. Click on image to enlarge. Author places image in public domain. Not to scale. In the above image, we see a cutting tool with two teeth. A cutting tool could have a single cutting tooth or multiple teeth, depending upon the gunsmith's desires. This cutting now needs to be mounted to a cutter body, so that it can be used in a rifling machine. 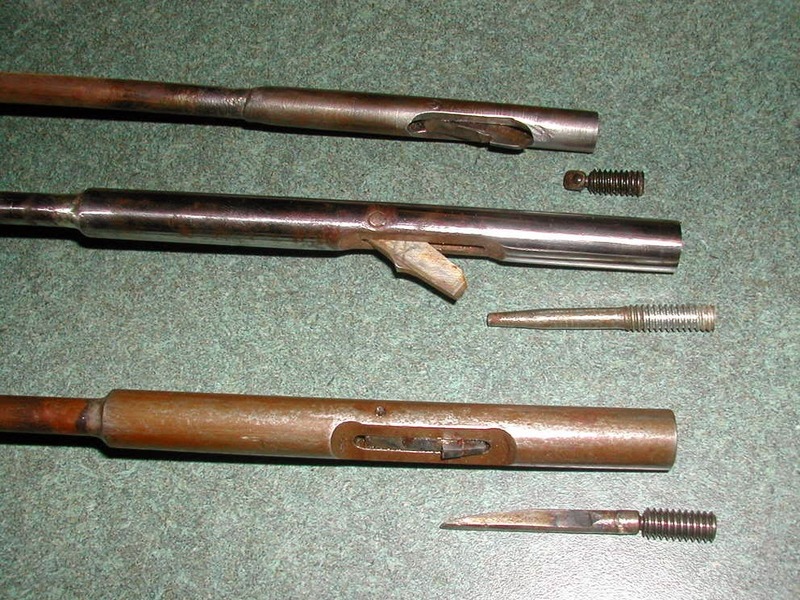 The simplest rifling cutters had the bodies made of wood. The gunsmith would first use a lathe to make a wooden cylinder out of a hard wood (such as oak or hickory), a little less than the diameter of the barrel to be rifled. Then the gunsmith would chisel out a slot on the top of the cylinder, just big enough to insert the cutting tool into the slot. The gunsmith would then insert the cutting tool into the slot and add glue to fasten the tool to the cutter body. Finally, as an optional extra precaution, the gunsmith would also wind some wet twine around the cutter body to overlap the tool's body. As the twine dries up, it tightens around the wood and secures the cutter extra-tightly to the body. A simple rifling cutter. Click on image to enlarge. Author places the image in the public domain. Not to scale. The above image shows how ancient gunsmiths would construct such a cutter. The advantage of this type of cutter is that it is relatively easy to construct. However, the height of the groove cannot be adjusted easily with this type of cutter. The solution is to adjust the barrel's position to deepen a groove and we will study that when we look at barrel clamps. In other cases, the gunsmith would simply move the cutter back and forth until it cut the groove to the required depth throughout the length of the barrel. Ancient Rifling Cutter. Click on image to enlarge. Author places the image into the public domain. Not to scale. In this type of cutter, the gunsmith can move the cutting tool down or up by moving the two shims closer to or away from the center of the cutter. Alternatively, the gunsmith can add more padding material into the center gap to raise the cutting tool. This type of cutting tool was commonly used by ancient gunsmiths, but the depth of cut cannot be set very precisely by moving the shims. Another more advanced cutter design that allowed gunsmiths to precisely set the depth of cut of the grooves was also used. To make such cutters, gunsmiths needed access to techniques to cut precise screw threads and make springs. These technologies were already known and perfected by clock manufacturers, so gunsmiths in areas that were famous for clocks (such as Nuremberg in Germany) took advantage of their knowledge to make a better rifling cutter. Click on image to enlarge. Author places image in the public domain. Not to scale. Click on image to enlarge. Author places the image in the public domain. Not to scale. In the above image, A and D are the screw threads that are cut on each end of the tube. C is the hole drilled across the tube, through which the cutter will be fitted to the case with a pivot pin. B is the slot cut on the top of the tube, that allows the cutting tool to protrude through. Click on image to enlarge. Public domain image. Not to scale. By rotating the threaded bolt on the left side, the gunsmith pushes the wedge in or out of the tube, which forces the cutter to rotate about the pivot pin and protrude higher or lower out of the slot B, which adjusts the depth of the groove to be cut. The metal block and spring push against the cutter and keep it from rotating from the other side. With this type of cutter, it is possible to set the depth of cut very precisely by rotating the bolt on the left side. This sort of cutter design was used by gunsmiths for a very long time, all the way to about World War II. In fact, we discussed this type of cutter way back when we studied cut rifling techniques almost four years ago. There are still some gunsmiths using such cutter designs today. Rifling cutters. Click on image to enlarge. 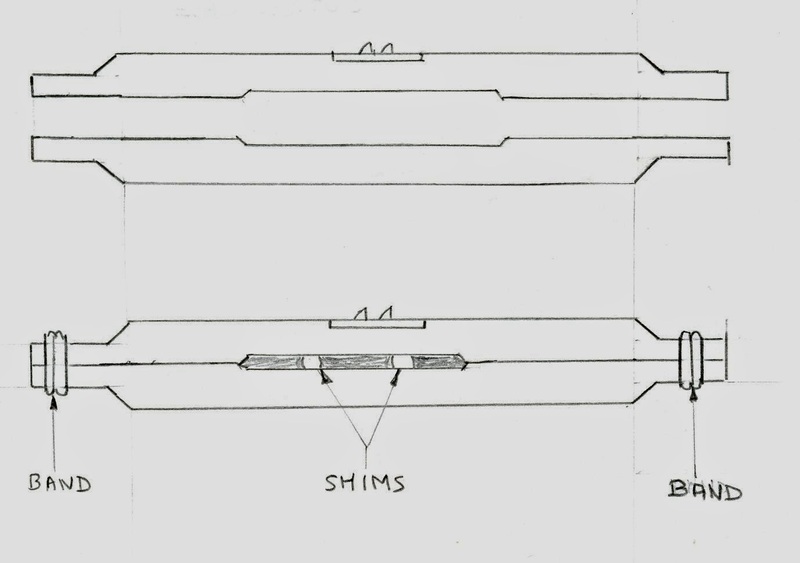 The above image shows three rifling cutters of this design. You can clearly see that each cutting tool is attached to its case using a pin. You can also see the wedges and threaded bolts on the right side of each tool. In this post, we have covered how the cutting tool was made throughout the ages. 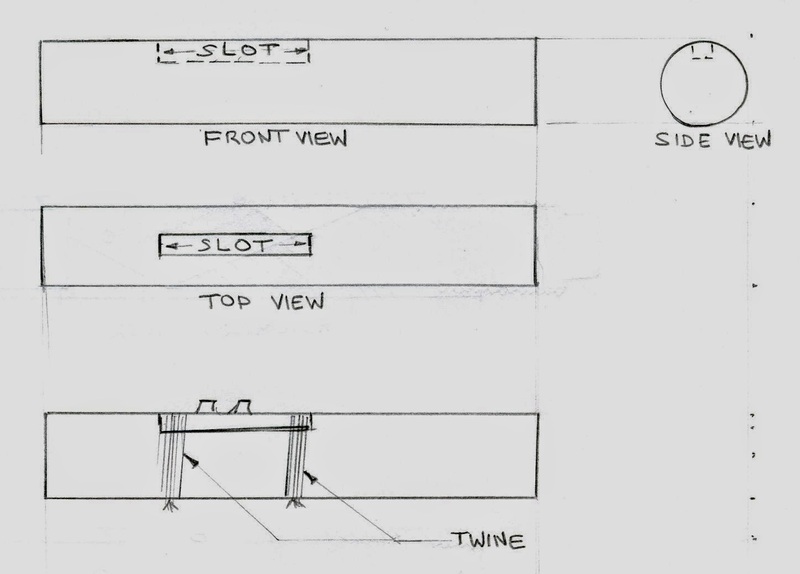 In the next couple of posts, we will study how the cutting tool was attached to the indexing guide and also study how the rest of the rifling machine was built.